Coast to Coast is an American style restaurant, with a menu full of burgers, steaks, and subs. From smokey to crispy. I have never been to Coast to Coast before even though I have seen a few of them, one being in Birmingham. To begin with, we were sat down instantly and given the menus to look at. I ordered a mocktail with coconut and pineapple. This was pretty refreshing considering it was a very hot day and we had been walking and shopping non-stop! My friend Keely, and myself, we both ordered the same starters and mains! This was more of a coincident than planned - I guess we have the same taste in food and that's why she is my best friend! For starters we ordered Calamari - This was fried to perfection and tasted delicious. It was a good sized portion but I did expect there to be garlic mayo sauce rather than tomato salsa so that was a little unusual but I ain't complaining! Next, we both ordered the Rump Steak with sweet potato fries, it came with salad leaves, onion rings and a slice of tomato. I ordered bbq sauce as extra and Keely ordered peppercorn sauce. If you are going to order the sauces as extras I would recommend not too. The bbq sauce was watery and barely any flavour and the peppercorn sauce had an artificial taste. We both decided to use ketchup and hot chilli sauce which was already on our table! Now to the main part, we ordered the steaks to be cooked as medium rare and for once it was! I say for once because any other place I have been to they have always over cooked it or kept it too rare. This place on the other hand though knows what they are doing. The sweet potato fries were crispy and there was a good amount of them. Keely also ordered a side of kale, which I wasn't keen on but she loved it! The whole meal was very filling and the staff there were attentive and always making sure we had everything we needed! As some of you know I have the Tastecard which I got with my student bank account, I have the app downloaded on my phone and with my location on I can find restaurants which offer 241 deals. 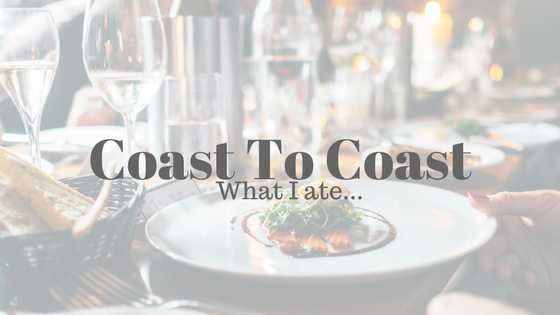 I didn't even think about using it, however while having my meal I thought you know what I will have a look, and to my surprise Coast to Coast were on the list! This saved us a good amount of money as the meal orginally came to about £85 and we paid in total around £45 including the drinks so worked out to be £22.50 each! BARGAIN! I would 100% recommend this restaurant if you want to go somewhere smart and at the same time eat comfort but high quality food! I can't wait to try out the other branches closer to home.